What’s Your Slice of God’s Image? My family is from Georgia, so my favorite pie is pecan, the nut of the south. Every year at Thanksgiving, we make at least two pies, filling the entire kitchen with the sugary aroma of caramel and toasted pecans. My mouth waters just thinking about it, (but my insulin-resistant, menopausal body shudders at the damage it can do.) There’s nothing quite like that first bite as the warm, soft filling and buttery crust melt in my mouth. If I didn’t have a family who also loved pecan pie, I’d probably eat the whole thing by myself! But, because I need to share, I get a slice. That slice is my portion. 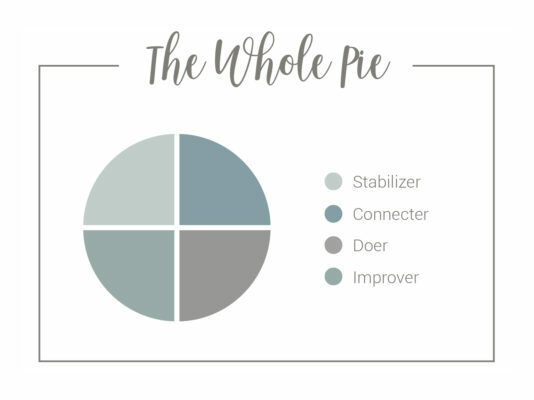 Think of God as the whole pie. He is the sum total of every virtue, such as wisdom, justice, grace, and mercy. By making us in His image, He shares those with us, but we don’t get them all—we get a slice. God’s comprehensive nature is simply too vast to be reflected in any one person, so God created different types of people, differ- ent types of moms, and different types of slices to reflect His many features. You and I get a slice of God’s image. As the Psalmist said, “LORD, you have assigned me my portion and my cup” (Psalm 16:5). Your distinct personality, the one crafted by God, is your slice of His image. Your slice is the set of traits He’s gifted to you and asked you to steward on His behalf. It’s critical that you are aware of your slice—your authentic personality—because if you aren’t, you’ll feel ill-equipped to do the job He’s given you as a mom. The brilliant thing about your slice is that it allows you to do some things very well—in fact, better than most. You might have a keen eye for detail and a knack for analysis that the rest of us can’t touch. Fantastic! Your family is blessed. But that God-given ability comes with an evil twin, a corresponding limitation, which explains why you’re horrible at networking and speaking in front of groups. That’s the nature of a slice—it comes with signature strengths and annoying weaknesses, all known and understood by God when He chose it for you. Remember, He never created you to be everything to everyone. 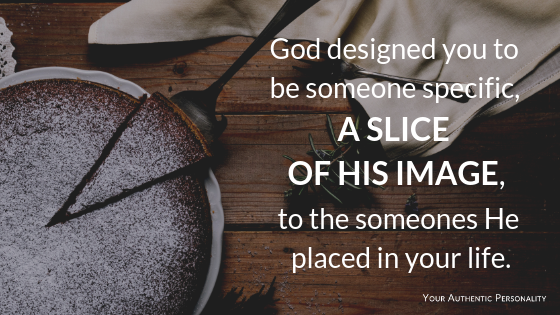 Instead, God designed you to be someone specific, a slice of His image, to the someones He placed in your life. All four of these slices make up a whole image of God. If you’re a Doer, you’ll likely reflect God’s action and His authority. If you’re a Connecter, you’ll reflect His communication and connection. If you’re an Improver, you’ll reflect His creative drive to make the world a better place. If you are a Stabilizer, you’ll reflect His peace and faithfulness. Together “we, though many, form one body” (Romans 12:5), or pie, to display a full image of God. Your children have a front-row seat to your slice. This is the portion of God’s character that you’ll demonstrate most fully for them, and the unique influence you’ll have on their lives. Your mothering should be an expression of your slice. It’s the best you have to bring them.